I know, I know, this is not a film and it's not really forgotten, but hey, Christmas is less than three weeks away and I am overcome with the spirit of good cheer and cute stuff. Don't forget to check in at Todd Mason's blog, Sweet Freedom, to see what really forgotten films and other audio/visual whatnots other bloggers are talking about today. It's always a fun, eclectic mix. 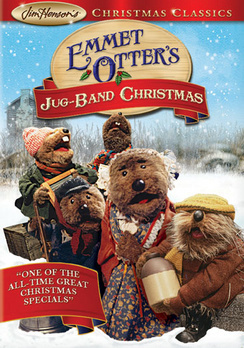 Jim Henson's exceedingly charming production of EMMET OTTER'S JUG-BAND CHRISTMAS is based on the 1969 book by Russell Hoban which features illustrations by Lillian Hoban. The special debuted on HBO in 1978 and later on ABC television. It is now widely available on DVD of course and you'd be foolish not to own a copy. 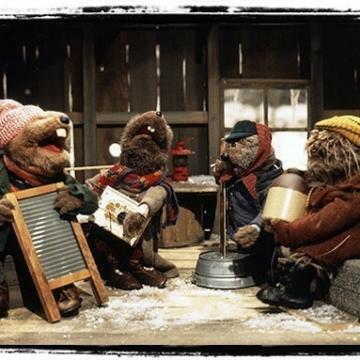 There are some stories that strike a chord with whatever part of you still believes in innocence and light and something about EMMET OTTER'S JUGBAND CHRISTMAS immediately takes you back to when you were a child and all things were possible. I first saw this with my 7 year old daughter and I think we both loved it in exactly the same way with maybe me being a bit more bowled over by the artistry and my daughter taking it all for granted as kids will. 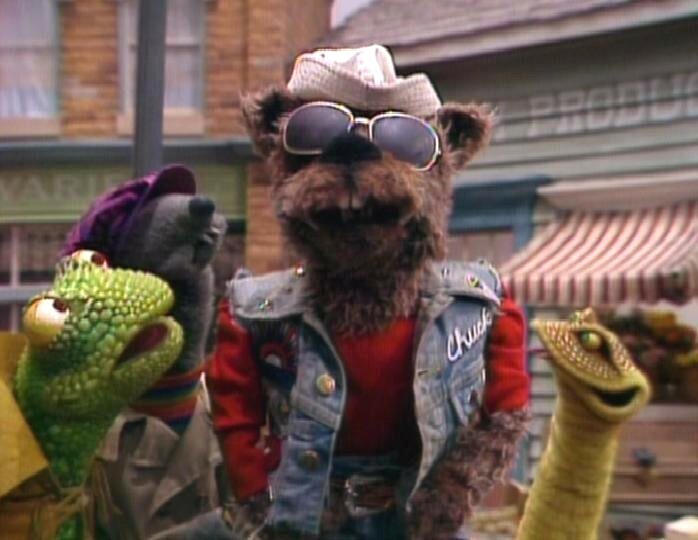 The only thing I know for sure is that whenever I watch Emmet - even now - I immediately suspend my disbelief and enter eagerly into the life of the furry and feathery denizens of Frog Hollow. 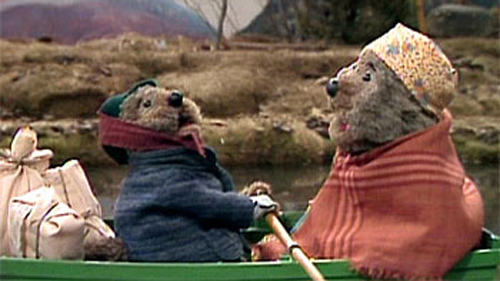 Henson and his oh-so-inventive crew (including the inimitable Frank Oz) use hand puppets, marionettes and all other sorts of magic to tell the story of a dirt-poor but honest widow, Alice Otter and her young son Emmet - both barely scraping by in their tiny house by the river. She does laundry for and is often cheated by the locals, and Emmet takes the odd job where he can find it. Both otters are fashioned by artful puppet-masters who have given mother and son adorably winsome faces which are at their most enchanting when they sing. Emmet and his Ma on the river before the freeze. Riverbottom band strutting its stuff around town. Not seen in this pix is the fish that travels with its own tank as a member of the band. The basic plot has a 'Gift of the Magi' flavor to it as Emmet wants to get his mother a piano and plots to win the down payment by performing with his little band at a talent show in Waterville, the next town over. The only hitch is that he must make a hole in his mother's laundry bucket - the only way she has of earning a living - to fashion a washtub bass for his band. She, unbeknownst to Emmet plots to enter the same talent show so she can buy Emmet a guitar. Emmet and his band rehearsing. The entire production is enriched by several hum-along songs written by Paul Williams, who went on to write many more tunes for the Muppets. 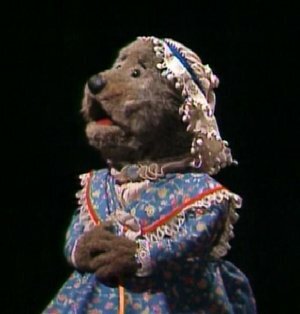 The songs are especially affecting when sung by the sweetly wonderful voice of Marilyn Sokol who brings Alice Otter to life. The scene of Emmet and his mom sliding down an icy hill to the frozen lake surface is worth the price of admission on its own. Needless to say, the talent show later is lots of fun too. Add in the touching ending and you have just about the perfect Christmas tale. This gem of a production was shot on tape rather than film which only adds an unique quality to the show. So, if by some happenstance you've managed to miss EMMET OTTER'S JUG-BAND CHRISTMAS, do yourself a favor and get your hands on a copy immediately. To read more about the behind the scenes expertise and techniques used by the brilliant Henson team, please use this link. Actually, now that I think on it, the Riverbottom band has its own devilish, heavy metal charm. But don't tell Emmet and his Ma that I said that. I can honestly say I have never heard of this one. Must have been after my kids were grown. Wonderful post, Yvette! Your enthusiasm for this Henson Christmas confection comes through clearly. I was a big fan of THE MUPPET SHOW growing up but somehow missed this one, though I've heard lots of good things about it...will try and hunt down a copy before Christmas. I'm afraid I'm one of the foolish who does not have a copy of this one, Yvette! Actually, I've never seen it. You make it sound so charming and fun, and the illustrations are adorable. My grandkids would love it. I'll see if I can get my hands on a copy. Nice review! This looks cute enough that it is worth a look-see Yvette :) Even in my (slightly) advancing years, I am all about everything related to Christmas programming. Thanks for sharing! Iba, this is certainly worth a definite look-see. :) It is charm personified. I love this movie. 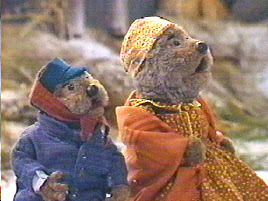 I wonder if you have seen Henson's other Christmas special The Christmas Toy. That is one of my favorites of all time. I saw this on HBO when it came out and liked it. Then, HBO played it nonstop for years after I outgrew the story and got completely sick of it. I recall reading that this was unavailable on DVD for a long time. Thanks so much, Jeff. Sorry I'm late to acknowledge, but I wasn't feeling well PLUS my computer was fussing.